Family Promise of Gwinnett County, Inc. brings existing local resources together to help homeless children and their families regain their housing and their independence, while maintaining their dignity. We mobilize congregations of faith, community volunteers, and social service agencies. Together we are ending homelessness – one family at a time. In September 2018 we suspended operations of the 11-bed emergency center and the aftercare programs due to lack of funding. See how you can donate to help us return to full operations. Volunteers with Family Promise children at Norcross First United Methodist Church. 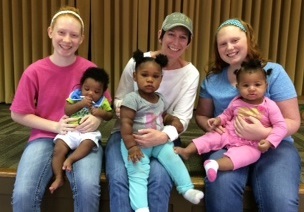 The ongoing program involves local faith communities hosting families for one week at a time in their facilities. Currently more than 40 congregations are involved in this homeless recovery program. We solicit host and support congregations, train their volunteers, and support each congregation’s volunteer coordinator. We review applications from literally hundreds of families applying to be part of the Family Promise congregational program. Our case managers assist the accepted families in developing a realistic plan of action to regain stability and establish a savings account. Qualified families are admitted for 30 days. Families who complete their goals and adhere to guest guidelines may extend their stay for another 30 days. The maximum stay is usually 90 days. Our staff and volunteers do not have the expertise to serve families who are struggling with domestic violence, mental illness, or drug and alcohol abuse. We refer these individuals and families to other social service agencies throughout Gwinnett County and the Metro Atlanta area.